Holy cow, how is it September already!? Its time to bust out the fall decorations. Remember in June when I built my Tabletop Football Toss Game for the Father's Day DIY workshop? Well, this month I'm partnering with The Home Depot to share a new, fun project and tell you about an upcoming Do-It-Herself Workshop. 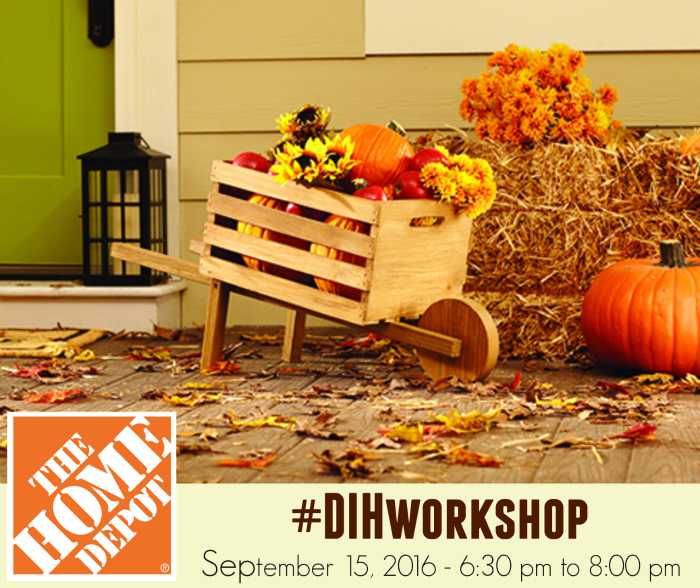 Head to your local Home Depot store on September 15th, from 6:30 to 8:00 PM, and learn to make this cute rustic wheelbarrow. And make sure to check back here next Monday (September 12th). I'll be hanging out with my good friend Brad from Fix This Build That and 23 other bloggers, sharing our own version of the rustic wheelbarrow. Can't wait! Nice post you won a follower :) congrats from Spain.